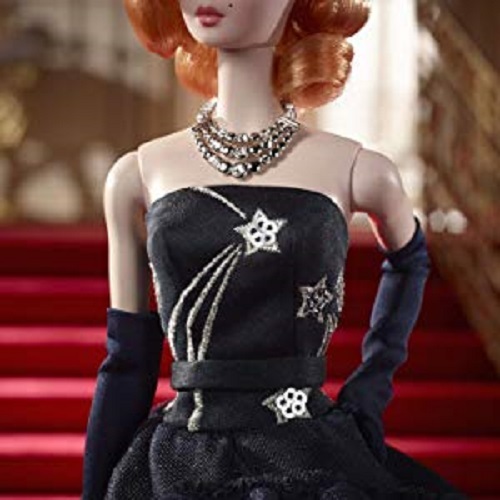 The Barbie Fashion Model Collection celebrates the timeless elegance of classic couture from the past and adds a contemporary twist. Dressed for a night to remember, Barbie stuns in floor-length flounces of navy blue chiffon atop a full tulle petticoat. Shimmering silver sequined stars illuminate the luxurious fabric while a silver and rhinestone matching necklace highlights her strawberry blonde hair and dramatic smoky eye makeup. Long navy evening gloves finish the elegant look. This BFMC collection doll features a poseable Silkstone body for endless posing possibilities. Includes doll, doll stand for display and Certificate of Authenticity.